Located in the beautiful and majestic place called Cedar City, Cedar City Library has been successfully operating for many years. Cedar City Library's mission statement: "The goal of the Cedar City Public Library is to provide prompt and friendly service to all patrons while realizing the commitment to collect and dispense information. As a center for recreational reading, community research and public service, the library serves as a source of self education, personal enrichment and as a repository of local history." Library shelving is essential to any library that operates in today's society. In fact, without library shelving, there would be no place to store and display books. To organize books even more efficiently, dividers can be placed on each shelving level. In this particular scenario, Cedar City Library was interested in plastic clips for their library shelving to act as book end dividers. NationWide Shelving was able to provide plastic clip shelf dividers to Cedar City Library at a low cost with good value. Because NationWide Shelving has experience with other areas of storage products and applications, NationWide Shelving was able to give the best advice on which type and brand of plastic clip shelf dividers would best suit this library's needs. The Feature: Plastic clip shelf dividers essentially complete library shelving's purpose in book organization. The Advantage: Plastic clip shelf dividers not only hold books into place, but they also physically separate sections into a more aesthetically pleasing design for a better organization system. The Benefit: Libraries, like Cedar City Library, can function day to day without clutter and chaos, because of plastic clip shelf dividers. Return on Investment: Books, and other similar media being placed by plastic clip shelf dividers, can easily have more accessibility, which maximizes work production for library employees. This also benefits library users who are looking for specific media on each shelf. Estey Library Shelving Components are readily available for purchase from NationWide Shelving. This includes plastic clips for integral back shelf dividers. Estey plastic clip shelf dividers are also shipped directly from the manufacturer to the customer, which means there is no time wasted after purchasing plastic clip shelf dividers. 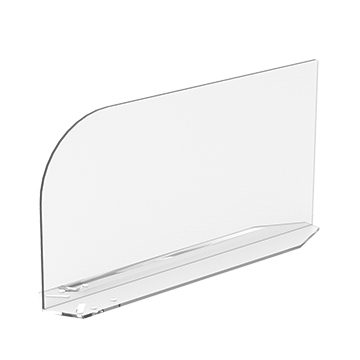 Plastic clip shelf dividers come in a variety of designs. 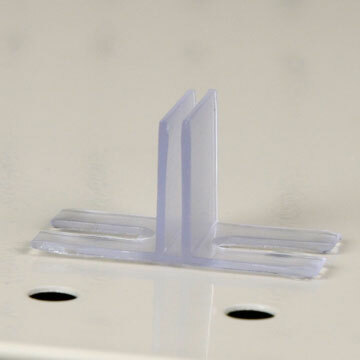 This means you have more flexibility in customizing the shape, color, and size of the plastic clip shelf dividers. This ultimately lets you choose the overall look for your library shelving organization needs.